The cold weather may be holding our Yoshino cherry blossoms hostage, but with 11 more varieties of cherry trees in the District, there may still be hope to see some blossoms. The popular Yoshino cherry trees make up about 70 percent of D.C.'s approximately 3,800 cherry trees, according to the National Park Service (NPS), and by now you may have heard cold temperatures could have frozen many of our little blossom friends. Kwanzan cherry trees -- the second-most abundant species in D.C. after the Yoshinos -- bloom 10-14 days after the Yoshinos. Because the Kwanzan cherry trees bloom later, their buds are protected from the bitter cold we're experiencing right now, the NPS said Wednesday. The Kwanzan trees are projected to bloom April 10-13 this year. They produce large, dense flowers with clear pink double blossoms. Find them in East Potomac Park on the Lower Potomac River side, near Buckeye Drive SW. The Shirofugen cherry tree blooms later than most cherry trees. You can recognize these blooms by their fluffy pink petals. To find these trees, try the area along Ohio Drive SW just south of Independence Avenue, south of the Korean War Veterans Memorial. The Usuzumi-zakura cherry tree variety also blooms after the Yoshinos, and the blossoms change from pink to white. In Japan, some Usuzumis are more than 1,500 years old. Find D.C.'s along Ohio Drive SW, northwest of the Franklin Delano Roosevelt Memorial. 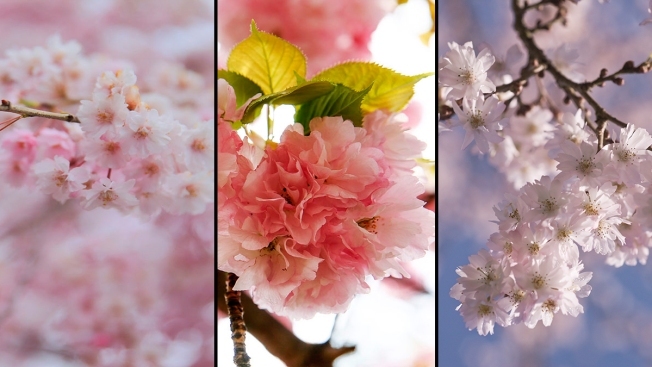 The autumn flowering cherry trees can bloom at any time of year, including fall and during warm spells in the winter. Look for smaller, less showy blossoms. You can find these trees near Bathing Beach, just slightly northeast of the Thomas Jefferson Memorial. The Akebono is a variant of the more common cherry tree and is located along Ohio Drive SW near Independence Avenue, just south of the Korean War Veterans Memorial. These small blossoms look very similar to the classic Yoshino cherry blossoms but have a slightly pink look. The NPS says they are also "less showy." The Fugenzo trees are a great example of how cherry trees are grafted and are easily distinguished by their thick, straight trunks, according to the NPS. These are located along Ohio Drive SW on the Lower Potomac River side, west of the Franklin Delano Roosevelt Memorial. Sargent cherry trees are planted individually and scattered throughout Potomac Park. You can find some southwest of the Jefferson Memorial, just south of the Washington Channel bridge in Potomac Park. To spot these small pink blooms, look for the leaves that unfurl with a purplish or bronze hue. The Takesimensis cherry trees have shorter, stubbier twigs compared to other cherry varieties. They were planted at Hains Point, the tip of land between the Washington Channel and the lower Potomac River, because they were expected to better tolerate the flood-prone area. Weeping cherry trees are easily identified by their long, drooping branches. They are found throughout the park, but you can find some along the Washington Channel by the Ohio Drive SW and Buckeye Drive SW intersection. It may be a bit too late to see some of these this year. Afterglow cherry trees bloom early and tend to peak ahead of the Yoshino blossoms. These are situated just south of the U.S. Interior Department and U.S. Park Police buildings, along the Lower Potomac River side of Ohio Drive SW in Potomac Park. Okame cherry trees have an earlier bloom and peak before the Yoshinos. Their bright pink blooms with longer, thinner pedals make them easy to spot. Find these near the cherry blossom shuttle stop on the Washington Channel side of Ohio Drive SW, just north of the Francis Case Memorial Bridge.